In 1875 C.L.E. Kaufman submitted plans for a luxury hotel in Zandvoort. It was built in 1879 at the start of the Boulevard de Favauge. 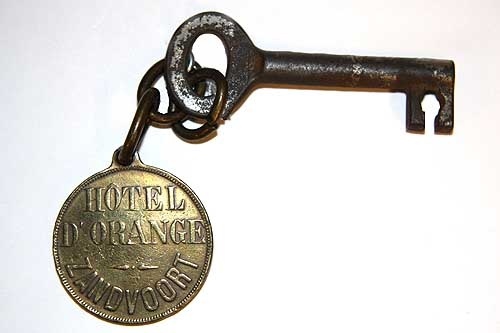 Two storeys high and very wide, the Hotel d’Orange was a striking, regal-looking building. It had four dome-shaped towers, two on the land side and two on the sea side, each provided with belvederes. On the ground floor of the sea side there was a lengthy verandah which had a balcony above it. The hotel was equipped with over a hundred rooms, a concert and theatre room, smoking and writing rooms, a restaurant and a special children’s eating room. An adjoining building housed the interior baths. 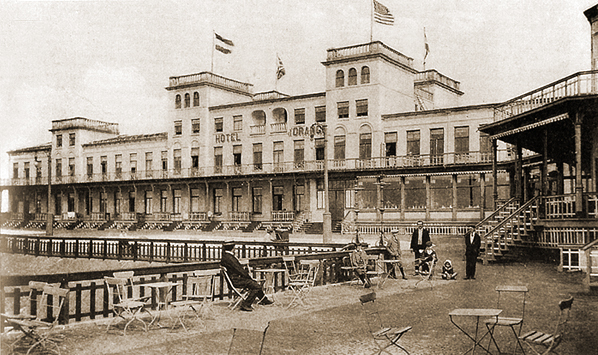 A skating ring was opened by the hotel on 26th June 1881. After changing hands in 1894 the four dome-shaped tower tops were taken down and the middle part was given an extra floor and the north and south wings were lengthened. In 1899 the restaurant was made much bigger with the addition of a verandah. As with the Hotel Groot Badhuis the main entrance was on the land side.